Capture the latest information about DGM, our associates or industry related matters. Your feedback is welcome and invited as constantly we strive to promote safety at sea. As part of the ongoing drive by our company to try and bring more accurate survey data to the Superyacht community via official electronic charts, our MD was asked to pen an article for Yachting Pages summer issue. Already receiving strong backing from many within the industry, if you want to know more or to take part in this task, please contact us. The article can be read via this link. In June 2018, the 5th edition of the piracy-specific Best Management Practice (BMP5) was published compiling a useful and comprehensive guidance which introduces effective measures for the protection of crew, vessels and cargo while transiting the Red Sea, the Gulf of Aden, the Indian Ocean and the Arabian Sea. The new edition supersedes BMP4. Download your free copy of BMP 5 from this link. Bluewater have for many years been providing high quality training ashore in Antibes and Palma and more recently through the amalgamation with ICT in Florida. 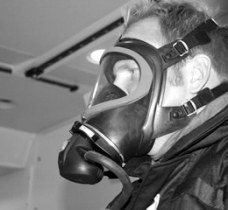 Da Gama Maritime (DGM) have in the meantime been providing their bespoke on board fire training for many years with a strong reputation for setting new high standards in bringing crew up-to-speed on the most effective techniques to help maintain their safety. Both companies have now combined forces to bring crew the advantage of high quality on board training which in some cases can be rewarded with approved certification. MCA accreditation is available to attendees in Advanced Fire Refresher and Crisis Management courses conducted on board. “We have been working with vessels from 36 thru to over 200m in length and crew numbers from five to over one thousand to enhance safety at sea since 2010 with our bespoke courses,” said Steve Monk of DGM, “now having combined with Bluewater we can bring the advantage of MCA certification for some of these” he added. Although able to provider MCA certified courses to the crew on board, the bespoke training DGM have been running in areas of chart outfit maintenance, navigation procedures and fire training as vessels emerge from build are still available with Bluewater clients receiving additional discounts. For further information on the available courses, please click on the 'Products and Services' tab above. 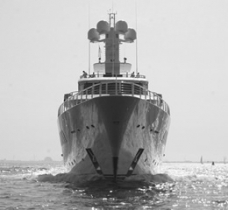 Continuing what is becoming a powerful operational narrative critiquing the industry's blame culture and highlighting why managers should be openly backing up their captains, our MD was asked to compose a thought provoking article for The Superyacht Report. Read the full article here. 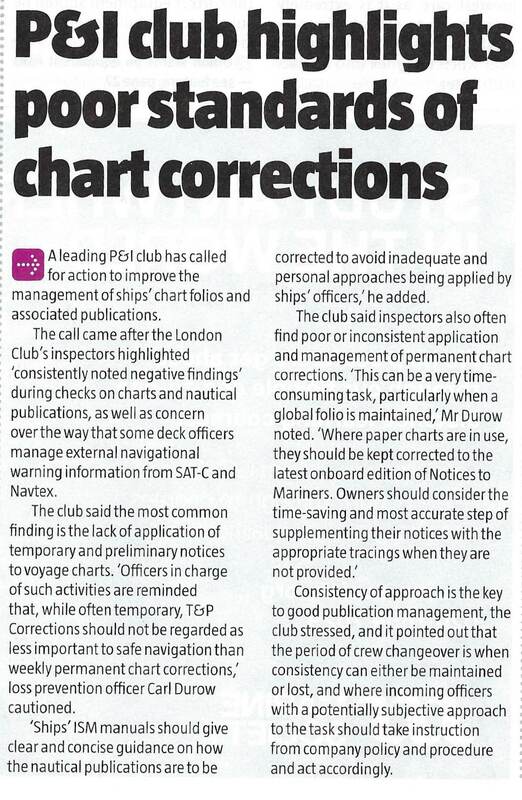 An article in the May edition of the Nautilus Telegraph has highlighted the poor standard of chart corrections identified during audits and investigations. The full article can be read via this link but as a reminder, DG Maritime employ chart correctors with over 40 years' experience who used to teach this dying art, As such we are well versed in the standards expected and can assist you as an individual vessel or management company who wants to improve the standards at sea in instructing your crew in the most effective and efficient means of maintaining the outfit. As part of our ongoing assistance to maintain safety at sea, we thought we'd post the latest guide from the Royal National Lifeboat Institution (RNLI) in respect to lifejackets. This is intended to support you in increasing or refreshing your knowledge on what you may find more suitable, convenient and safer to supply to crew and guests when taking part in any water based activity. Download the guide from this link. Should you require any further information or detail then feel free to contact us particularly as we're a distributor for CrewSaver and can meet all you needs in this environment. We are delighted to announce that our chart correction software the 'Vasco' app has received formal recognition from the Maritime and Coastguard Agency as an acceptable means of maintaining a paper chart outfit in accordance with SOLAS V regulations. A copy of the letter of approval can be downloaded from this link. 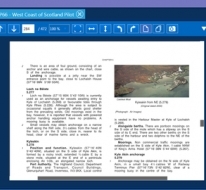 While we're conscious many vessels are reducing their paper chart holding in favour of operating on ECDIS in order to meet the necessary IMO regulations, many ships still carry a reduced paper Get-You-Home folio and as such the app is ideal for their operation, reduced bandwidth communications and importantly, budgets. However it doesn't matter if the chart outfit is large or small, the app provides many benefits to the operators particularly in keeping the entire process simplistic and not over burdoned with complex and unnecessary features. It also allows management companies remote direct access to determine the correction status of their ships at any time. Further information can be found at this link or on the Vasco page of this website under the Products and Services tab. "Inspiring excellence in service by developing caring hospitality professionals"
We are proud to inform you that Luxury Hospitality Management and Da Gama Maritime have signed a partnership. Combining our hospitality and safety related trainings and our lifecycle management services, provides us with a unique learning and development platform with the emphasis on crew continuous professional development and guest safety. As co-founder and managing partner of the Luxury Hospitality Group, Henk Akse, believes a collaboration with Da Gama Maritime will provide unique continuous professional development opportunities for the industry. "The partnership will strengthen both companies says Henk. This way we are able to offer an integrated portfolio of services to the customers. Call it a 0ne-Stop-Shop: we call it a value chain of services which will enable the customer to manage cost of ownership and return on investment easier. Our customers demand top quality services with high efficiency and effectiveness for the entire crew, operations and management of the yacht. Our customers and crew deserve such services. We look forward to our collaboration!" Steve Monk says Da Gama Maritime is delighted about the collaboration. Both companies recognise the higher standards which can be achieved by working directly with crew in their own environment to refine and professionalise the crew, everyone benefits. "It seems to us that many Captains, management companies and shipyards are beginning to recognise that more can be gained by engaging with companies providing bespoke tailored courses to the needs of the yachts to train crew to the highest service and safety levels possible as part of continuous professional development on board". We know a number of our clients carry drones on board to capture those special moments of guest trips and for that they provide a fantastic service, but with the temptation to fly these where perhaps the local authorities may see things differently, we thought it might be useful to republish an article from a recent trade magazine highlighting a reminder to be cautious where you launch. Read more at this link. A topic we bring up regularly during our on board fire training but now being made publically aware due to the recent incidents, crew are advised not to leave mobile phone charges unattended as these have a tendancy to heat up significantly to the point of catching fire. An article within the Safety4Sea publication has helped emphasise the point and can be read at this link. The Paris MOU have recently published their annual report on the outcome of Port State Control inspections. Detention rates have remained stable but of concern is that the report has highlighted the top categories of deficiencies and the top deficiences as fire safety and safety of navigation. Both of these are areas this company provides a solution for in respect to on board fire training as well as professional navigation management with the provision of navigation related stores. A summary of the report can be viewed via this link or alternatively for the full report it be downloaded from this link but as always, with many of the top deficiencies being something this company exists to rectify, if we can assist you, your fleet or your ship, we stand ready to do so. As part of their ongoing mission to enhance navigation standards in the maritime industry, on 1 September the navigation management company Da Gama Maritime (DGM), will launch their new ‘Vasco App’. 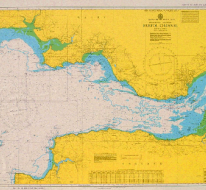 Having been accepted by the United Kingdom Hydrographic Office (UKHO) as meeting the rigorous standards to provide official paper chart corrections, this is the first means by which the information is provided to the mariner via an electronic tablet device. DGM’s Managing Director Steve Monk said, “We appreciate there are other chart correction software packages already available but it became apparent to us that many of them are overcomplicated and bombard the mariner with more functionality than they need or want. 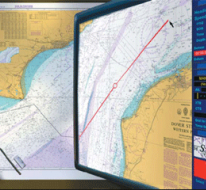 Despite our providing feedback to these companies, we realised the best course of action was to develop our own software which simply provides the chart corrections, tracings, blocks and notices required to maintain the paper chart outfit.” He went on, “We’re also aware that while many vessels are moving to ECDIS, a large number still carry a reduced paper outfit but don’t want to pay high costs for software to download corrections to what amounts to a few weekly updates. Our app provides a much more economical solution with reduced download times, lower software costs and less time spent correcting the outfit”. The team at DGM are all mariners with over 130 year’s combined navigation experience and therefore utilised their background as well as working with trusted clients to generate an efficient and easy to use app which provides simple flexibility in chart outfit maintenance. As a distributor of UKHO products it was evident to DGM that it was not necessary to incorporate any of the ADMIRALTY Digital Publications (ADP’s) as updates to these are already available free of charge from the UKHO through e-mail and the internet. In what is believed to be another industry first, the ‘Vasco app’ has been developed to allow for multiple copies of the same chart to be recorded in the system. 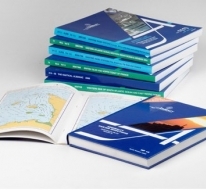 This makes it ideal for training academies to keep a record of the correction state of every chart even when they have many copies of the same one for their students, or for vessels which have routes inked in on copies of the same chart for regular routes in or out of port. Each copy of the chart can be given a unique tag or label to identify them. Folios within the app can be generated to either UKHO recommended folio listings, as unique named custom folios to that vessel or both. “We’ve seen that clients signed to our navigation management service don’t all follow the UKHO folio listing and therefore it was important for us to generate a product which suits everyone. 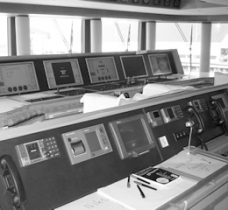 This app does just that and allows charts to be moved freely from UKHO to custom folios and vice versa, logged as dormant or ashore and even for the shore side correcting department to update the vessel’s outfit and record corrections completed when the charts are returned on board in order to reduce the workload back on the vessel” said Mr Monk. With the ‘Vasco app’ available from the Apple iTunes or Google Play store, it can be downloaded free of charge straight to any tablet and after a one month free trial, once an account has been subscribed to through DGM the mariner can get straight on and start correcting their outfit without any software having to be mailed to the ship or engineer sent to install it. “We have clients using Apple and Microsoft computers but to the best of our knowledge no other provider has produced a chart correction software to suit Apple. With the app now available to any supported tablet, that problem has been resolved making life just that bit easier for the mariner and allowing them to quickly and easily keep their outfit up-to-date”. For further information and to register interest to the service please visit www.vascoapp.co. or contact us. During our onboard fire training sessions, it has come to light that vessel crew are being misguided by some management company SMS procedures and more worryingly, Flag States. While we are aware different shoreside training centres teach procedures slightly differently, when it comes to the safety of the crew in the maintenance and use of the BA, the manufacturers recommendations must be followed. We have recently come across incorrect references and thus guidance to vessels from management companies which would be questioned by investigators in the event of an incident. As such we ask all those who are responsible for the maintenance or use of firefighting equipment on board to be familiar with the manufacturers recommendations and to ensure they are reading from the correct reference material. A dedicated page within our website has now been established at this link for further assistance but if you are still in any doubt, please don't hesitate to contact us.